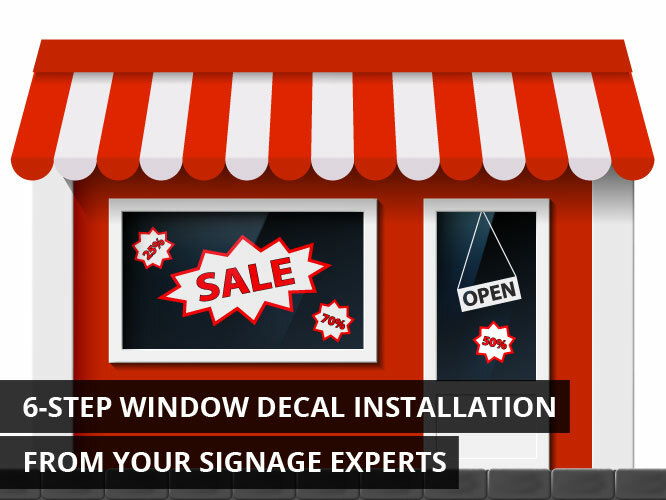 Window decals are a great way to boost your business’s curb appeal and push new promotions without eating up wall space, but they’re not as easy to install as some would think. When done improperly, window decals can wrinkle, bubble, or scratch. Worse still, you can ruin your whole storefront by marring your window frontage with a sticky mess. If you’re going to go through the time and effort it takes to conceptualize, design, and manufacture a window decal, you’d better be willing to do it right. With that in mind, the SignWorld team has assembled some easy-to-implement tips to help you install your window decals. We have been in the signage business since 1913, and have seen and experienced much of what the industry has to offer – to our experts, a little window decal installation is a breeze! A spray bottle containing water and a few drops of a commercial dish soap of your choice. We recommend no more than 3-4 drops per pint of water at most, and strongly urge you to err on the small side. Something hard and straight-edged. Credit cards, rulers, hardcover book covers, and picture frames can all be effective. The first thing that you’ll need to do during your window decal installation is identify which side is the protective sheet. This side is easy to identify because the protective coating reflects light. It will also feel smooth in contrast to the opposite side, which will be rough or textured by the ink and graphics displayed there. Regular window decals have the protective sheet on the back of the image; the decal itself sticks to the front of the window. However, if you’ve ordered an “inside glass” window decal, the protective sheet will be found on the front of the image. These are readable from the outside. Though the varieties of window decals vary, the installation process itself is basically the same. Having identified the protective sheet, remove it by peeling away the plastic coating. The plastic is often thin and difficult to see, but we can assure you that it’s there! Spray the adhesive side of the decal with a light coating of water. Don’t be stingy – you want enough moisture on this side to allow the decal to slide around on the window at this stage. Make sure the window is clean – you may even want to invest in a professional cleaning before you begin your installation. Otherwise, spray it down with your preferred cleaning products and give it time to dry thoroughly. If you neglect this step, you’ll probably end up with poor adhesion and wrinkles. Spray the window generously with your mixture of water and soap. Place the wet decal on the window. Since both surfaces are currently wet, you should easily be able to slide the decal around. Make sure the decal is positioned exactly where you like it before moving on to the next step. Grab your hard edge – whichever one you chose – and move it like across the surface like a squeegee, raking the air bubbles and excess water out from between the decal and window pane. Once the water is remove, leave the decal to dry for 1-2 hours, and you’re done! Note that large-scale decals often require more than one person to prevent it from rolling it on itself. If you have any other questions about window decal installation, or would like to explore some other signage options, don’t hesitate to contact our team of experts at https://www.signworld.org.